At Wedgy's we know that quality employees make the difference! We are always looking for professional, courteous employees who understand that providing great customer service is the most important asset they can bring to our company. If you consider yourself reliable, motivated and hard working ... Wedgy's Pizza wants to hear from you! A smile and a willingness to work to the best of your ability. A fun work environment providing flexible hours, competitive wages and the opportunity for advancement. Drivers earn an hourly wage ($6.60 / hour or higher depending on experience and length of employment), along with tips and nightly mileage reimbursement. Most of our drivers will average about $9.00 – $15.00 / hour. Job Description: Deliver Wedgy’s products in a safe and efficient manner. Additional duties include answering the phones, prepping and/or making food products, restocking inventory items, cleaning the restaurant and interacting with customers in a polite and friendly manner. Job Requirements: Must be at least 18 years old and have a safe motor vehicle in good mechanical condition. Must have a minimum 2 year uninterrupted driving record and provide a 3 year MVR that meets the minimum requirements as established by our insurance company. Must also carry at least the state minimum amount of liability insurance. Basic math and phone skills also a must. Inside personnel are needed to answer the phones, make food products, and wait on customers. We pay an hourly wage amount that varies depending on experience, efficiency, and the ability to interact with customers in a friendly, courteous and professional manner. Flexible hours are usually available, but weekend work is required. We find that this is usually a great job for young adults in High School. Job Requirements: Must be at least 16 years old. No experience is necessary as we will provide training, but applicants must enjoy working in a fast paced environment, speak English clearly, possess good phone skills, and enjoy interacting with customers and other employees. 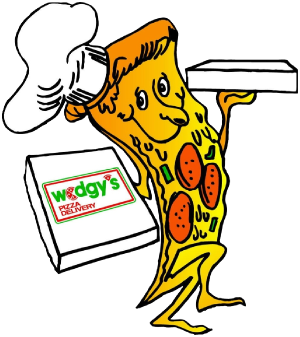 Managers at Wedgy’s earn a competitive salary or wage, along with an aggressive bonus program based on store sales, performance and profitability. If you are interested in a management position and believe you have what it takes to make a pizza delivery store succeed, please contact us. We look for individuals with natural leadership skills along with a strong focus on quality and great customer service. We prefer all manager applicants to work as drivers and/or inside personnel during a training period to learn the basics of our operation, but will quickly promote individuals that show the dedication, desire and ability to become a leader of one of our teams. Download our employment application, print it out, complete the application and drop it by either of our two Wedgy’s Pizza locations. If you are interested in a management position, you may also send your resume to our office at the following address.